Strength did not rally round ! Inspired idea won the round ! Shivaji readied for fight. He rose with a special mantra suggested by Sahyadri. Which one? Guerrilla strategy. 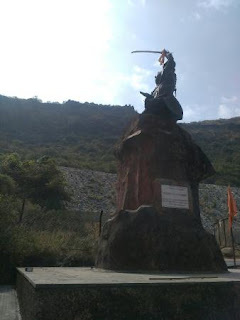 Fateh Khan camped towards northeast of fort Purandar near Belsar town. He made a stormy attack on Shirval's fort Subhanmangal to the south of the fort and won. Saffron flag took flight. A tremendous blow on a most sensitive spot! One fort gone! Shivaji reached Purandar. He left Kavji Malhar with a posse of Mavalas on fort Subhnmangal. 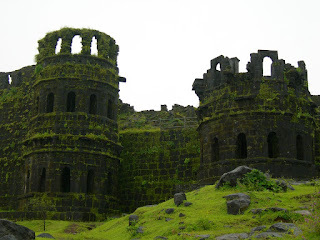 He heavily battered the fort and Badshah's fort commander Balaji Haibatrao got killed. Others scattered helter and skelter. Fort was won. Once again saffron flag flew. Win, Win! This victory encouraged Marathas. Now it was Fateh Khan's turn. Decision was taken to attack and take on. Suddenly, secretively. Then Shivaji extended friendship to Delhi durbar to bring pressure on Vijapur's Badshah. This too was a guerrilla tactic. Now if Shahaji were not released, Delhi's military rage would result. Difficult proposition. Realising this Adil Shah released Shahjiraje. (16th May 1648) This was a full moon day. The threat to Swarajya and Shahji's life was averted by Shivaji's intelligent and strong guerrilla strategy. Jijau learnt of this happy information on Rajgad. She was delighted. So you care for your husband? Come on ahead and plead! Completely engrossed in making new ambitious plans, Shivajiraje and Jijau had absolutely no inkling of this horrible disaster. Reports of Shahaji's arrest and Khan's advance followed one after the other like bolts of lighting. Enter Rajgad shook with this news. Adilshah had snatched Jijau's lord! And second noose was thrown to kill everyone including Swarajya. As if Badshah had thrown a question to Jijau, "State what do you want! Your husband or sovereignty? And demanded from Shivaji the same answer, "Speak! You want your father or sovereignty?" What now? Whom to save? Revered father or Swarajya? Only surrendering at Badshah's feet can save Father! Otherwise death to all! Whom to save and whom to let die? Both are equally precious, and revered. What a Solution! What an utter disaster. Adilshah's this poser shocked all ambitions, all intelligence, strength, all plans, oaths and politics. Afzal Khan carted Shahji towards Vijapur. At the same time Fateh Khan advanced towards Swarayjya like an emissary of death. What to do? Worry smouldered like a funeral pyre. Now plea, appeals, requests, and shouts were directed to the original power, Goddess Bhavani! Impart strength, provide inspiration, grant some mantra, suggest some technique, give power. Rise, rise! Alas ! Deception and treason ! Hands bound firmly in chains! Shahji was highly respected by people in the south. Generals Afzalkhan and Lahumanji Jyoti constantly complained that Shahji does not put in proper work for the Badshah and is in fact harmful! Thus Vijapur durbar fumed against Bhonsale father and son. Shah made a shrewd plan to deceitfully arrest Shahji in secrecy. He was convinced that when Shahaji was thus caught in the net, that rebel Shivaji would have no alternative but to surrender unconditionally to sae his father's skin. The plan was clever. And clandestine. This task was given to the commander in chief, Mustafakhan. He really hated teh Bhonsales from the bottom of his heart. Taking about fifteen thousand troops with him, khan started marching for Jinji from Vijapur(17 Jan 1648). This plot of arresting Shahaji by trickery was kept strictly under wraps. Shahajiraje was comping near Jinji with his soldiers. Venkat Naik was to begin the campaign to win the fort Jinji. RAje thought that chief was coming for help. Mustafakhan arrived. Raje was on guard, as he knew Khan's cunning nature. Khan and Raje met. Outwardly friendly and something else within the heart. Khan couldn't get an opportunity to strike. Raje was ever watchful. So Khan started sweet-talking, presented valuable gifts, established trust, and tried many ways to make him lose his guard. A few months passed in this charade. Raje was watchful. One day Raje laughingly said to Khan, "Treacherous folks show great love before the deception!" Khan was shocked and for moment got flustered, but he quickly added, "I swear on my dear Atishkhan. I will never decive you." Khan ordered Bajiraje Ghorpaade to attack Shahaji. He did. Raje lost consciousness. Bajirao put handcuffs on him them and there. (25th July 1648).